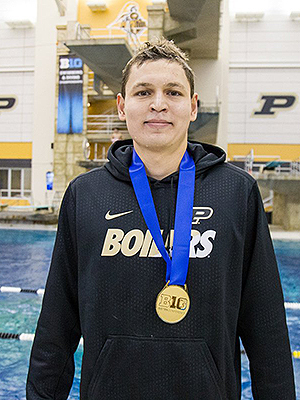 Marat Amaltdinov’s dual excellence as a student-athlete for Purdue men's swimming and diving not only earned the Big Ten breaststroke champion 2017 Academic All-America honors, but also a bachelor’s degree from the Krannert School. His speed in the pool was matched by his performance in the classroom, where he compiled a 3.81 grade-point average as an economics major with a finance minor and graduated in just three years. As a native of Russia with one year of college eligibility remaining, Amaltdinov next enrolled in Krannert’s Master of Science in Finance program. Amaltdinov was born 700 miles from Moscow in Orenburg, where his father first encouraged him to take up swimming. “He wanted me to stay active and productive instead of focusing only on school, so I just kept at it,” he says. Because Russia has no collegiate athletic system, swimming also is what brought Amaltdinov to Purdue. “In Russia, your only real opportunity to compete in sports in college is to come to the United States,” he says. A two-time Big Ten champion in the 200-yard breaststroke, Amaltdinov is the first Purdue men’s swimmer to earn Academic All-America accolades. By repeating as the Big Ten champion in the 200 breast, he also became the first Purdue swimmer to accomplish the feat in any event since Louis Paul won three straight 200 individual medley titles from 2003 to 2005. At the 2017 NCAA Championships, Amaltdinov finished seventh in the 200 breast, helping the Boilers finish in 13th place nationally, matching the program's highest finish in the modern era. He also is the Purdue record holder in the 200 breast, establishing a new benchmark at the Morgan J. Burke Boilermaker Aquatic Center when he won the event at the 2016 Big Ten Championships. Still, none of it would have happened without support. With fewer than 10 scholarships available for men’s swimming and diving, full rides are the exception rather than the rule. But Amaltdinov’s combination of athletic and academic prowess made it possible, and he’s been lapping the competition at every turn.